In Stock! Rush, Express or Urgent shipping options not available. This attractive Inspirational Teardrop Heart Pendant with Cubic Zirconia Accent keeps loved ones close to your heart each day. A beautiful inscription of: "There are no goodbyes for me. Wherever you are you will always be in my heart." comes on the heart. 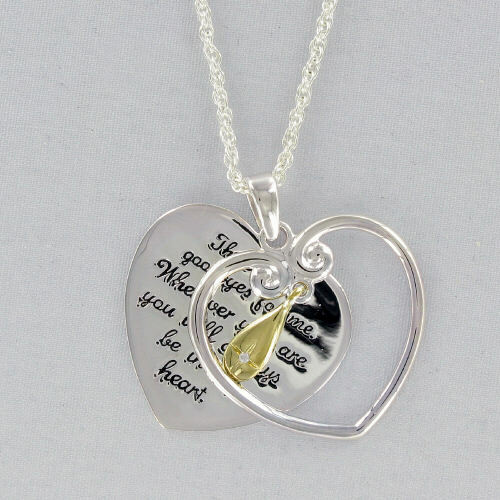 This beautiful necklace is truly a thoughtful sympathy gift that comes from the heart. Heart Pendants are laced with an 18" Silvertone Rope Necklace featuring a lobster claw closure. Love this. I get many compliments, each time I wear it! I really like the necklace. I woke have personalized it but couldn't figure out how to do so. This necklace is beautiful. In honor of my son who recently passed.He's forever in my heart, and I have shed lots of tears.Just perfect!!! Additional Details Cherish the special memories you have of a passed loved one with Personalized Memorial and Sympathy Gifts from GiftsForYouNow.com. Memorial Gifts create unique keepsakes that become cherished gifts to help treasure memories.